You haven’t been paying attention to the recent news this week on Staten Island. By tonight, all MCIs/Prevost will cover up the coin section on the farebox. If Byford leaves, I sure as hell hope that Darryl Irick doesn’t take over the reins. That guy is a bean counter to the core, ask anybody on the bus side. Don't forget the mayors! NYC's contribution to the NYCT ops budget has declined precipitously over the years. Really, ever since the '70s fiscal crisis, NYC (and NYS) has been pursuing a strange brand of neoliberalism-pretending-to-be-progressivism. Economically, those policies probably saved NYC (especially given the federal government's reluctance to help with budgetary relief), but there has been a failure to create a vision for a post-austerity government, and equally a failure to reinvest the fruits of growth into the public services that enable it. So what we have today is a strange jumble of piecemeal governmental structures, agencies, laws and regulations, each very much products of their era and none altogether functional, while the city's greatest public infrastructures (subways, parks, bridges, schools, hospitals, public housing) lie underfunded/poorly managed and without vision for their future. NYC government has the potential to be -- and really should be -- a massive force for good within its mandate. But again, it needs leaders. You could blame all that construction with the Department of Environmental Protection and contractors installing pipes all over East New York and Canarsie. So buses on that side will continue to run like hell. Distance is not the issue Babylon gets a train in each direction every 30 minutes during off peak hours, no other line gets that Babylon is completely elevated. No other line gets that Babylon is getting a lot of it's stations overhauled. Not a single Far Rock/Long Beach Branch station has been so much as touched I could go on, but I won't. What are You saying? 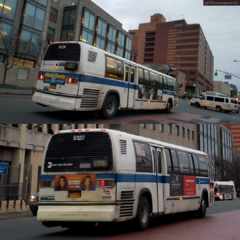 Are you speaking for Flatbush depot? Let me remind you that each depot is different from one another. If one depot has somewhat amount of buses that they have to retire, then that new order will be assigned. They will not grant one depot an entire fleet of buses just because one says so. The only company that should get HMDs are those from BC. Sorry to say this but some depots could have one designed fleet (40/60 ft buses). Example: JG has all NFs but they have more Old school but upgraded engines than the Xcelsior CNGs. CH has all Novas for locals but have Prevost, and MCIs on their express roster. 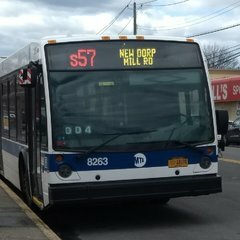 MV has all Orion 7s but split OGs and NXGs so if you was lucked out of that old Spaceship looking bus from 2009, wake up! This isnt BK! But Cuomo himself keeps saying that he doesn't actually control the MTA. Um...that happened back in 1990-1991 and look how that turned out. In 1991, two-way streets yet again! Aside from being wholly unqualified based on my nonexistent credentials (Alexandria Ocasio-Cortez actually studied law), I won't even be eligible to be governor for several years. As for someone else who I think would be a good fit, no one comes to mind. Meadowlands should also have 18117, correct? 18118-18119 are at Saddle River, and I think those are lavs too. Egg Harbor also has 18120-18125...? They pretty much end there as it is, but on a more logical (and accommodating) route. Cue the width being a greater issue than at the next street north, not to mention that not everyone is trying to reach the . Oh, okay, so Linden Place is magically wider than Union Street in order to handle the turn without conflict. Good to know. Perhaps it would be better to take a good look at Union Street and Kissena Boulevard before making that conclusion. Then close Main Street to cars while allowing buses and trucks to use it. Not only are cars better suited for those smaller spaces, but they literally do not need to enter Flushing from Northern Boulevard, especially since they're not large vehicles on fixed routes.